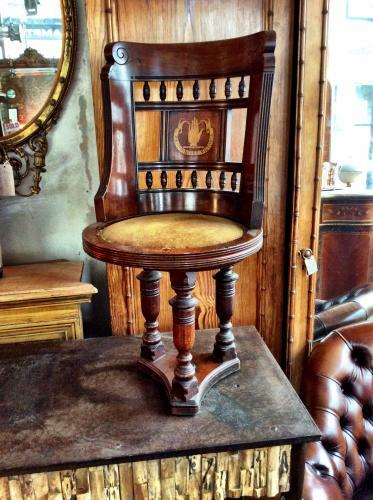 A rare chair taken from the Victorian Paddle steamer P.S Princess Victoria. A paddle Steamer that operated on Caledonian and Northern Irish passenger and Mail routes between 1890 &1910. The revolving chair with central back panel displaying the hand motif relating to Northern Ireland & Ulster above the a ribbon . The fixed cushion seat above three column supports connected to a triform base with central bolt hole where th chair would have been fixed to the flor of the boat.